Professional drone and FPV pilot grid_FPV does live broadcasting via quad cam for events that are shared all over the world from Japan. 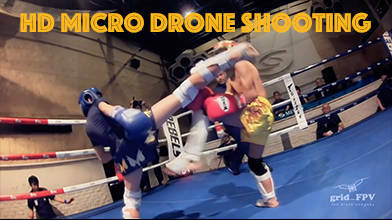 In this high def FPV footage, he flows in and around an amateur kickboxing match for PANCRASE MMA. Using a custom made micro drone, he keeps in close proximity to the fighters making sure to dodge the jabs and snap kicks being thrown around.